The OCS is delighted to announce guided viewings of For Blessings and Guidance: the Qianlong Emperor’s Design for State Sacrificial Vessels and Strokes of Wonder: Figure Painting by Ren Bonian from the National Art Museum of China with Professor Josh Yiu, Director of the Art Museum of The Chinese University of Hong Kong. For Blessings and Guidance showcases over 60 items of Qing ritual vessels and a Blue silk dragon robe, Jifu. The ritual vessels displayed are rare examples of ritual vessels specified in the Illustrated Compendium of Ceremonial Paraphernalia for State Rituals (shortened as Illustrated Regulations). 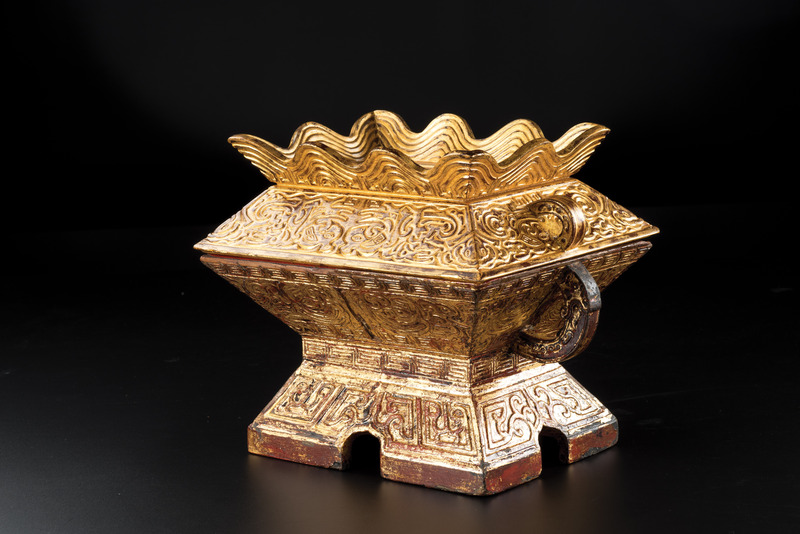 Although thousands of The Illustrated Regulation vessels were produced and used at state ritual altars and temples in Beijing between 1748 and 1911, few have survived to the present day. For the first time, this exhibition gives us a glimpse of the part such vessels played in creating solemnity and magnificence for the ceremonies where Qing emperors offered prayers for blessings and guidance, and the wellbeing of their Chinese empire. Read more. Following a tour of For Blessings and Guidance, members will be taken through Strokes of Wonder, the first major exhibition of the ‘Shanghai school’ master Ren Bonian (1840-1895) in Hong Kong. The 82 works on display are on loan from the National Art Museum of China, and include a rare oil portrait of the artist by Xu Beihong. Professor Josh Yiu is the Director of the Art Museum of The Chinese University of Hong Kong, where he has curated and supervised over thirty exhibitions. He received a B.A. in Art History from the University of Chicago, and completed his doctorate at Oxford University. Prior to serving at CUHK, he was the Foster Foundation Curator of Chinese Art at the Seattle Art Museum.